I’d like to thank everyone who appeared in the video for their time in helping me make the video possible. As you can imagine, there was a lot of networking and talking going on during the day and, not surprisingly, all the bloggers were far keener on wanting to speak to each other rather than have me shove a camera in their face! Click here to follow the Bloggers Bash magazine on Flipboard. Thank you. I hope you’ll be able to come along. Thanks so much for linking up to my posts, Sherri. The video seems to have gone down very well. It may have taken me 3 days to edit it, but I had great fun creating it. Thanks so much for being a part of it. Try and watch it in one go if you can. It’s just under 30 minutes long, so grab yourself a beverage, sit back, and enjoy. It was great seeing you (and Mike) again. I’m so pleased we had time for a catchup. 😀 As usual, time seemed to fly pass us that day. Thank you, Sherrie. If it wasn’t for all you budding actors, I’d have no video to make. I have to thank you all for allowing me to record you all. I enjoyed the whole process, from the filming to the editing. I think it helps bring people who can’t be there, to be right there in spirit, anyway. Thanks for being a part of the video, Sam. I had to do a lot of editing to get the video under 30 minutes, but it seems everyone who has watched it has enjoyed it. Oh yes, don’t use up all your data on the video, Liesbet. It’s not going anywhere, so will always be on my blog to watch. I hope you’ll enjoy meeting everyone once you get to watch it. Thanks, Debby, and thanks for watching it all. I know how time is precious to all of us. I had to edit out a lot just to get the video under 30 minutes. I’ve learned a lot about video editing since I started filming these events. I’m enjoying it very much. I enjoyed asking the questions, and just about everyone was up for being filmed. It also helps that iMovies has become easier to use. For example, adding text to the video is now a lot easier to do. Thanks so much for telling me how my blog is displaying. I wasn’t aware. I’ve been in touch with WordPress and they advised me to reduce the size of the font in the header from medium to small. I’ve now done that, so I hope it displays better. They did say that many people like the size of the header in the Hive theme (the one I’m using). I did check out how it was displaying on my desktop, iPad and iPhone, and on John’s computer, and it looked all OK, but I decided to reduce the size of the font anyway. Another reader told me that my blog now has the feel and look of a newspaper. I like the sound of that very much. 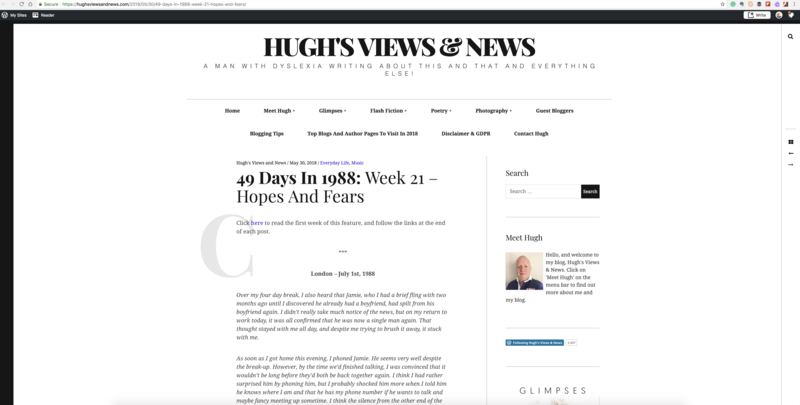 Please do let me know if it has helped with the way my blog now displays. My only other option is to change themes. Hi Debby. Yes, I’ve had a look at my blog without being logged in, and the header isn’t showing as being big. I’ve taken a shot of it. I’ve also had a look at John’s computer (he uses a MAC as well) and it displays the same as mine. Nobody else has mentioned it to me, so it looks as if I’m going to have to change the theme. It’s probably the theme that I have chosen that is doing this. I’m about to take a blogging break during June, so it’s something I’ll take a look at, but thanks for letting me know. I don’t like the thought of readers being put off because they can’t see much of my post on the preview screen. I’m guessing that in the previous themes I’ve used, the header wasn’t casing the same problem? Hi Debby. I just checked out the Sisters of Fey blog and now see what you mean about the header. However, I’m able to scroll down to read the posts and rather like the layout. In fact, it’s what I do on most of the blogs I follow. I’ve spoken to WordPress about it again and they said that many readers don’t mind having to scroll down to read posts. However, they’ve also told me that the size of the header can be reduced by adding some code to the CSS on a blog. Now, that scared me because I’m no ‘coder’ but I’ve asked the WordPress blogging forum community for some help on how to do this. I’ll see what they come back and say. 😄 I won’t mess about with it before going away but will have a look when I get back. On the other hand, I may just change my theme again and choose one that does not have such a big header. Lots to think about. Thanks so much for telling me about this. Hi Hugh. Not sure when you last visited the Sisters of the Fey blog, but Colleen has been struggling with this same issue and seems to have found a happy medium. If you go back to that blog now, yes, you will first see that giant header, but as you scroll, the header disappears. On your blog as it looks now, the header comes along as you scroll. taking up a lot of the reading space. Hi Debby, I’ve spoken with WordPress this morning and this is what they are telling me. If some users can still see the menu stick, that could be some caching left on their browser and they’ll need to clear it. An update on the header, Debby. WordPress tells me that they’ve fixed it now, so the header is no longer sticky. Would you mind checking it out for me? Thank you for making us all part of the Bash, Hugh! I hope the next time I am there live again! Yay! A video! This is going to be so much fun, Hugh. I can’t wait to get home so I can watch it. Congrats to everyone. Thanks so much for doing all this. Hugs! I really enjoyed filming the Bloggers Bash and asking all the questions, Teagan. It was great fun and helped me with my new-found love of video editing. I love this! Though I do sound a little bit like Mr. Bean. You’re getting more and more professional with the production Hugh. V slick…. Hugh Roberts has put the #Bloggers Bash Video online.. meet those who attended and catch the action… something to show you what you can sign up for next year. Finally watched it all in one go! I know you always love that part! Oh that was so much fun watching the videos Hugh, thanks for putting it all together!! Lovely to see everyone and to be a part of it all. You’re welcome, Debbie. I enjoyed filming the event and asking the questions. It’s also helping me with my video editing skills. Awesome video! Thanks for sharing this, Hugh! This is awesome Hugh! It is so nice to see everyone even if I couldn’t make it to the bash! For some reason, your comment ended up in my WordPress spam folder! Yes, it was a terrific day. The smiles and hugs said it all. This was terrific! ❤ Thank you, Hugh, for all you do to make these wonderful videos. It brings everyone right into my living room and that is a good thing TA! It looked like fun! Many more bloggers were there in spirit if not in person, so thank you for the film. Good to see the Geoff and Sheri show and their shout outs to Charli and her Carrot Ranch. I believe many watched some of the day via ‘Facebook live’ as well. I captured a lot more of the day, but the video would have been far too long. Geoff and Sherie do their show for the video every year. It wouldn’t be the same without them. I hope so too Hugh. Thanks, Hugh, for making us feel like we were there! Yes, please do, Norah. It’s far better watching it the whole way through instead of little chunks. This year’s video is by far the longest, but I managed to edit it down to just under 30 minutes.